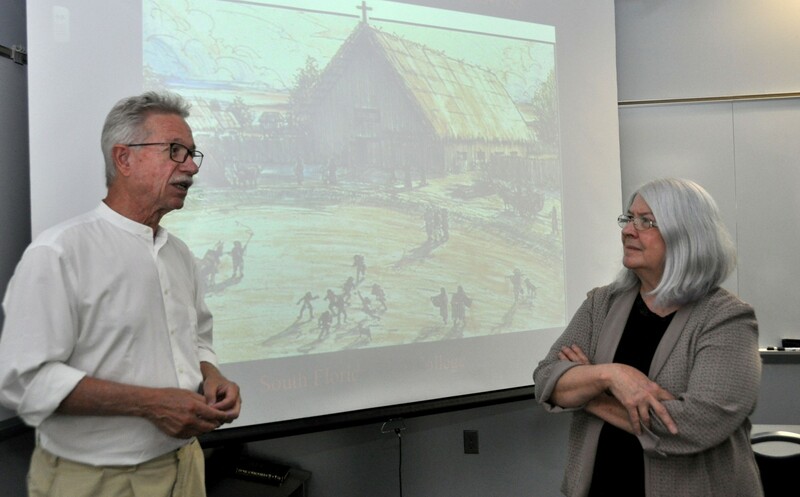 Dr. Jerald T. Milanich and Dr. Charlotte Pressler take part in "Florida's Spanish-Indian Missions, 1565–1763," part of the A Sense of Home program. Image courtesy of the South Florida State College Department of Humanities. South Florida State College’s (SFSC) project, A Sense of Home, seeks to infuse the state’s rich and unusual history into literature, philosophy, psychology, sociology, humanities, and studio art courses. Located in Florida’s sparsely-populated rural center, SFSC is a two-year college that primarily serves lower-income, first-generation college students. With NEH funding, SFSC brought experts in Florida’s history and culture to the college, where they spoke and led discussions on the state’s Indigenous peoples; the history of early cattlemen and agriculture in the region; the establishment of maroon communities in the 18th and 19th centuries; the literature of Zora Neale Hurston; and the role of women in the state after the Civil War and through the 1980s. The project’s ultimate goal is to help SFSC students develop a richer understanding of the state’s history and their place in it while using their own experiences as a mode of entry to new academic content. The programs have reinvigorated faculty interest in the state’s history and provided new knowledge for them to integrate into their courses. Funding from the NEH has allowed the library to purchase research materials to be used by students and the general public. With this support, Charlotte Pressler, who directs the project, is able to offer her students greater insights into how and what to research for their final papers, and the students are able to access the materials they need. In the longer term, faculty are taking their new knowledge and turning it into course modules that will help teachers integrate Florida’s history and culture into a range of academic subjects. And by creating modules, rather than new courses, the project ensures that students will remain able to transfer their course credits to the state’s four-year colleges. The final products will be published and shared broadly with Florida’s academic community and will be used by college faculty and high school teachers alike.